Japanese astronaut Soichi Noguchi kicks up his legs and small skis during a makeshift Winter Olympics event aboard the International Space Station in February 2010. NASA's shuttle Endeavour was docked at the station during the 2010 Winter Olympics in Vancouver, BC, Canada during its STS-130 mission. UPDATE (June 19): The astronauts' schedule may not allow any time for re-enacting the Olympics, NASA officials now say, although the crew will be kept abreast of the games and their home countries' medal counts. To mark the upcoming Olympic Games in London, a crew of astronauts due to launch to the space station this summer is planning an orbital sporting event for the occasion. NASA astronaut Sunita (Suni) Williams, Japan Aerospace Exploration Agency spaceflyer Akihiko Hoshide and Russian cosmonaut Yuri Malenchenko are due to launch July 14 to the International Space Station. Their planned four-month stay in space will overlap with the London 2012 Olympics July 27 to Aug. 12, so the sporty spaceflyers have something up their sleeves to celebrate the event. "Something unique about our increment is we have a very huge sports event during our increment, so what we're talking about amongst ourselves is, why don't we do some kind of sports event onboard the station too?" Hoshide told reporters during a NASA preview the mission. "We're just tossing around ideas right now, what kind of sport event we can do. That's something I'm looking forward to." The spaceflyers tried their hand at space skiing, the zero-G luge and weightless figure skating, all the while beaming a video of their orbital Olympics to Mission Control. "You are officially the only folks who are able to get more hang time than Shaun White," the American gold medal-winning snowboarder, Mission Control radioed to the astronauts. This time around, the spaceflyers are still working out which orbital events to stage, given their limitations. 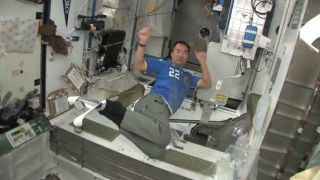 "We just thought it would be something fun to do on orbit," Hoshide said. "We have limited space and limited equipment." Williams herself has participated in weightless workouts before, when she ran along with the Boston marathon on the treadmill aboard the International Space Station in 2007. She completed the marathon in four hours, 24 minutes, all while orbiting the Earth at some 17,500 miles (28,163 kilometers) per hour. "Doing anything to encourage physical fitness would be great," Williams said of the upcoming Olympics plans. "I think we're going to do something a little bit more team-oriented this time around, rather than a marathon. I don't think I'll be in marathon shape, but I will be in good sprinting shape."